MYRTLE BEACH, S.C. (April 3, 2018) - In conjunction with the Chicago Cubs, the Myrtle Beach Pelicans have announced their 2018 Opening Day roster, which features six Top 30 Cubs prospects and 10 players who return from last season's playoff squad. 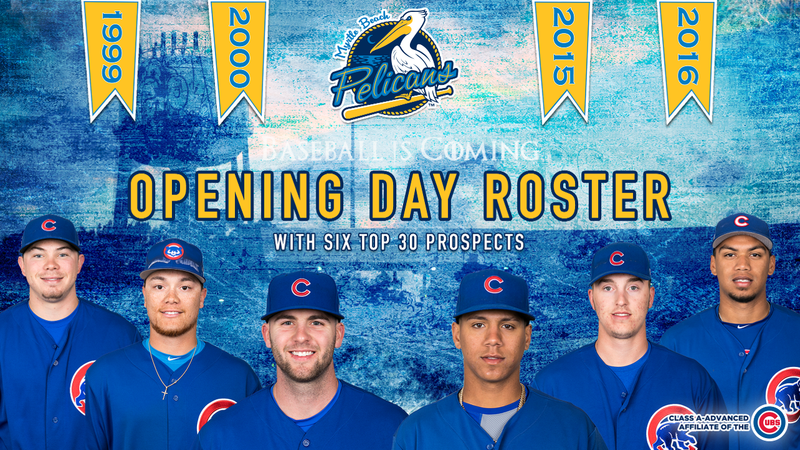 Of the six Top 30 Cubs prospects, three will take the mound in 2018 for the Pelicans. Chicago's 2017 first-round selection Alex Lange (No. 5 by both Baseball America and MLB.com) leads the way after pitching in Short Season Class A Eugene last year. Keegan Thompson (No. 14 Baseball America, No. 19 MLB.com) and Bryan Hudson (No. 13 Baseball America, No. 25 MLB.com), who each have starting experience, round out the top Pelicans' pitching prospects to begin 2018. The remaining three players ranked among the Cubs' Top 30 will look to find a home in the batter's box at TicketReturn.Com Field at Pelicans Ballpark. The youngest player on the team, 19-year-old Aramis Ademan (No. 1 Baseball America, No. 2 MLB.com), makes his High-A debut with the Pelicans this season after slashing .267/.324/.427 in 68 games split between Eugene and Low-A South Bend. The speedy D.J. Wilson (No. 9 MLB.com, No. 11 Baseball America), who swiped 15 bases last season in South Bend, and Wladimir Galindo (No. 26 MLB.com), who hit .290/.350/.432 in 44 games with South Bend before suffering a season-ending broken leg in June of 2017, join Ademan in the position player ranks. The Pelicans will welcome three familiar faces back to the hill in 2018. Ryan Kellogg , who finished second on the team in innings pitched a year ago with 103.2, and Casey Bloomquist (28 appearances, nine starts) each return as an option out of the bullpen or in the starting rotation. Jordan Minch provides bullpen experience after 29 appearances last season. Chad Hockin , Tyson Miller , Jose Paulino , Tyler Peyton , Jhon Romero , Matt Swarmer and Wyatt Short round out the newcomers to the Grand Strand on the mound. Hockin and Short both spent all of 2017 in the South Bend bullpen, with Hockin going 3-4 with a 3.95 ERA in 38 games and Short adding 40 appearances in which he accumulated a 4-3 record and a 3.19 ERA. Romero joined Hockin and Short on July 19 and became a stellar mainstay in the bullpen, posting a 0-1 record and 0.35 ERA in 13 appearances for South Bend. Miller, Paulino and Peyton all had their hand in the starting rotation for the Low-A Cubs, though Peyton spent most of his season in the bullpen. He went 3-3 with a 3.19 ERA in 18 games (four starts). Paulino and Miller finished 2017 third and fourth, respectively, in both starts (22 and 20) and innings pitched (123.2 and 120.2) for South Bend. Swarmer logged time for each of Eugene, South Bend, Double-A Tennessee and Triple-A Iowa. P.J. Higgins and Tyler Pearson return for the Pelicans in 2018. Higgins posted a .327 on-base percentage in 98 games while throwing out 35 percent of base runners, and Pearson battled through an injury to slash .257/.339/.425 over 35 games. Jhonny Pereda rounds out the catchers in his first season with the Birds after a .249/.335/.290 campaign over 92 games with South Bend in 2017. On the infield, the Birds host a trio of holdovers, as Tyler Alamo, Vimael Machin and Andruw Monasterio all come back to Carolina League. Alamo was stellar at the plate in 2017 for the Pelicans, hitting .281/.322/.422 with 24 doubles and 12 home runs. Machin joined Myrtle Beach on July 14 and slashed .274/.341/.331 over 45 games while Monasterio spent part of May and June with the Pelicans and had a .600 OPS in 26 games. Austin Upshaw , who put together a .292/.337/.407 slash line in South Bend, will make his High-A debut this season with the Pelicans' infield as well. In the outfield, Daniel Spingola and Connor Myers are back for the Pelicans. Spingola hit .267/.343/.416 in 107 games between Myrtle Beach and Tennessee a season ago and will be in a Pelicans' uniform for the third straight year. Myers dazzled in the outfield with several diving catches in 2017 and played in 95 games for the Birds. The other newcomers in the outfield besides Wilson in 2018 are Kevonte Mitchell (.713 OPS and 11 home runs in 115 games with South Bend last season) and Chris Pieters (.254/.340/.384 slash line in 86 games with the Low-A Cubs in 2017). Buddy Bailey, who enters his 30th year as a minor league skipper, will serve as the Pelicans' manager for the third consecutive season. Pitching coach Anderson Tavarez also returns for his third year in Myrtle Beach. Ty Wright rejoins the Pelicans as the hitting coach after serving as the assistant coach in 2017 and Carlos Rojas slots in as the assistant coach in his first year with the Pelicans. Athletic trainer Logan Severson and strength and conditioning coach Keegan Knoll, who are in their first seasons with the Birds, round out the staff. The Pelicans' 2018 roster is preliminary and subject to change. Myrtle Beach's 2018 campaign begins on Tuesday, April 3, when the Birds travel to Charleston for the Battle of the Beaches exhibition game against the Charleston RiverDogs at 7:05 p.m. at Joseph P. Riley Park. The regular season opens on Thursday, April 5, with a four-game set against the Frederick Keys at TicketReturn.Com Field at Pelicans Ballpark. Tickets are available for all 2018 regular season Pelicans' home games at www.MyrtleBeachPelicans.com/Tickets. The 2018 season will be the 20th season for the Pelicans franchise and fourth as the Class A-Advanced affiliate of the Chicago Cubs. For tickets visit MyrtleBeachPelicans.com/tickets, call (843) 918-6000, or visit the Pelicans Box Office.